Softening the hardscape of concrete or stone paving, steps or walls with pocket gardens can give you the look of a well established landscape in a short time. Certain plants lend themselves to these exquisite little gardens, particularly those plants that drape and billow naturally. Especially valuable specimens are those plants that have the ability to colonize dry soil among stones, such as Sempervivum and Jovibarba. As the colony grows the chicks fall to the ground to create an intriguing textural tapestry. Thyme varieties that stay low growing even when flowering such as a Thymus pseudolanuginosus and Elfin thyme are valued for creating a soft edging to steps, or cascading over a bank or slope. Planted at the edge of patios, brick walkways or paved areas these drought tolerant steppable plants give the whole area a feeling of romance and antiquity. Steps specially constructed with small cavities and fissures can be planted with Armeria, Iberis or alpine plants which relish the dry well drained conditions. They’ll enhance the landscape with flowers in succession and textural foliage through out the seasons. Favorite varieties of Sedum groundcovers and even tender succulent plants are great drought tolerant choices for jewel like pocket gardens. 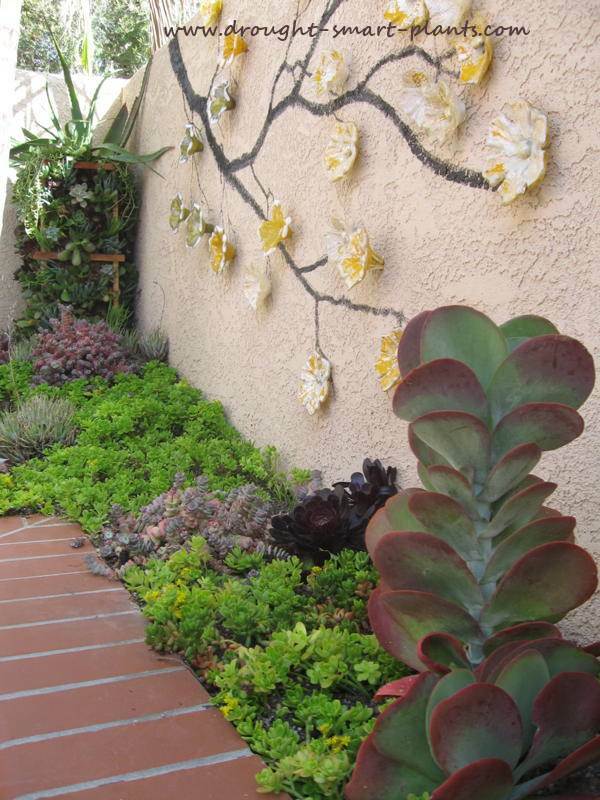 Other xeric plants and groundcovers can spill over the edge of a walkway, or even be planted around the base of a trough or container of succulents placed on a patio. Investigate plants that are easy to maintain and not invasive, as the tight confines can be difficult to renovate. Pay particular attention to the type of soil that you plant the hardy succulents into. 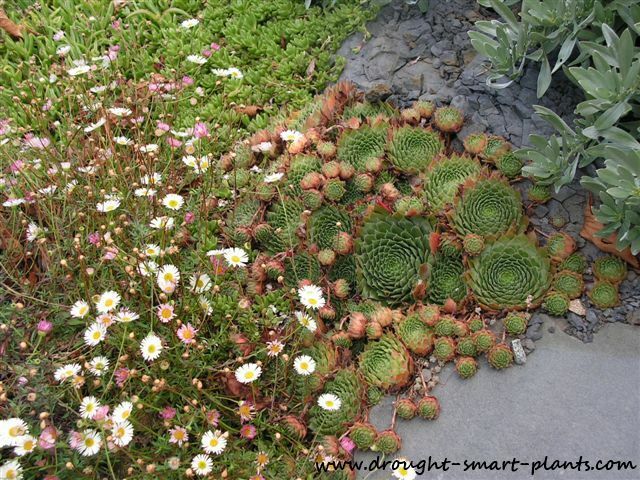 Depending on what is surrounding the garden such as pavement, flagstones or concrete it's crucial to have really good drainage, and make sure in the design stages that you don't accidentally create a sump, where excess water will collect - this is the surest way to kill off any type of succulent plant, and most other delicate and fragile alpines. 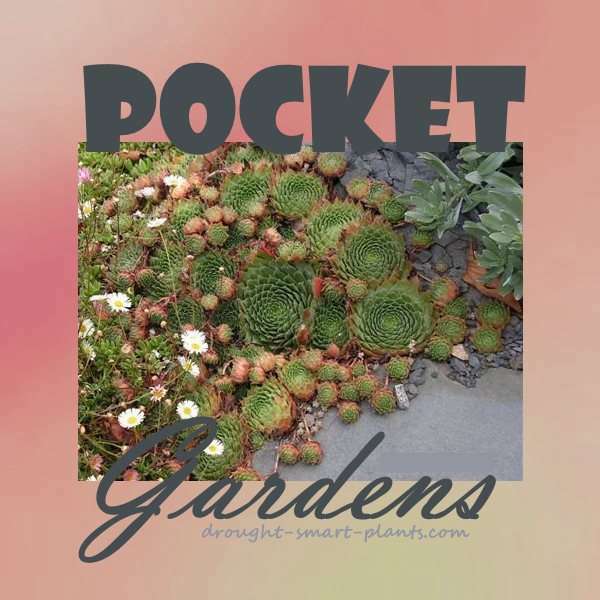 Design your pocket gardens to accent existing plantings, soften hard landscape features or draw attention to a focal point in the bigger picture of the xeric garden.